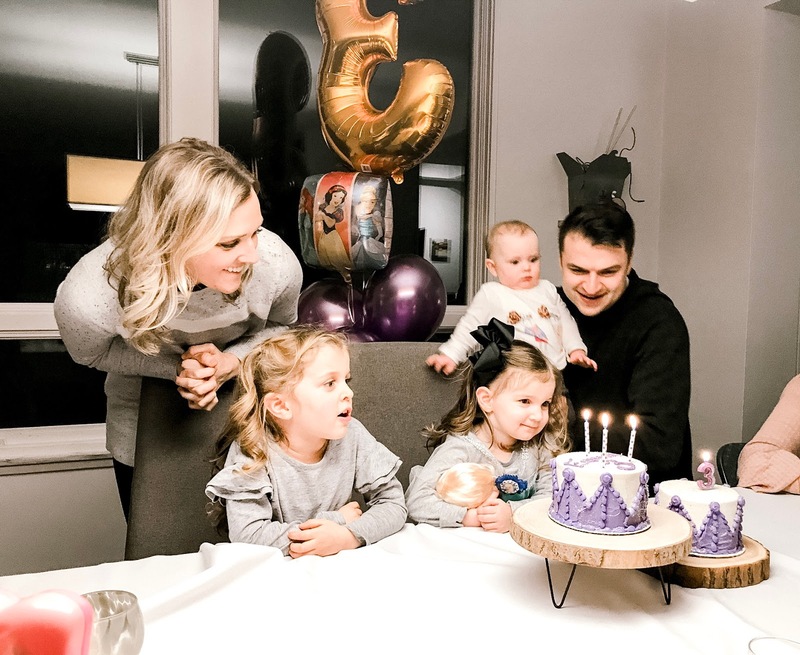 We had the best weekend celebrating Emerson's 3rd birthday! The big girls and I were up bright and early on Friday morning to get ready for our big adventure. The girls were so excited and wanted to dress "fancy" for their day in the city, I think they did a great job putting together their outfits, as you can see, they were very understated ;) They requested I put a few curls in their hair, topped off their looks with lipstick (aka Chapstick) and in the words of Emerson, they were "ready for the day!" We met up with my Mom, Grandma and Mother-in-Law and our Uber (my Dad) drove us to the train station. 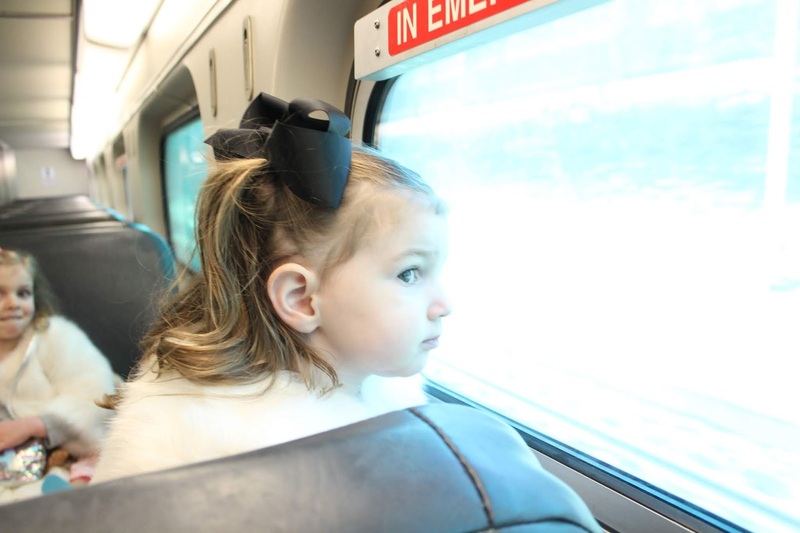 My girls loved taking the train and it was so nice to be able to sit and chat instead of being stuck in Chicago traffic! 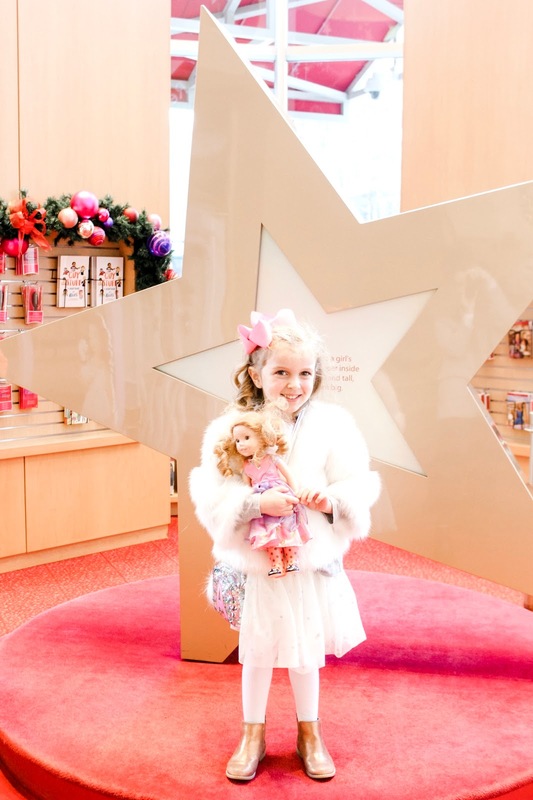 When we walked up to the front of the American Girl Doll store, Avery literally screamed! 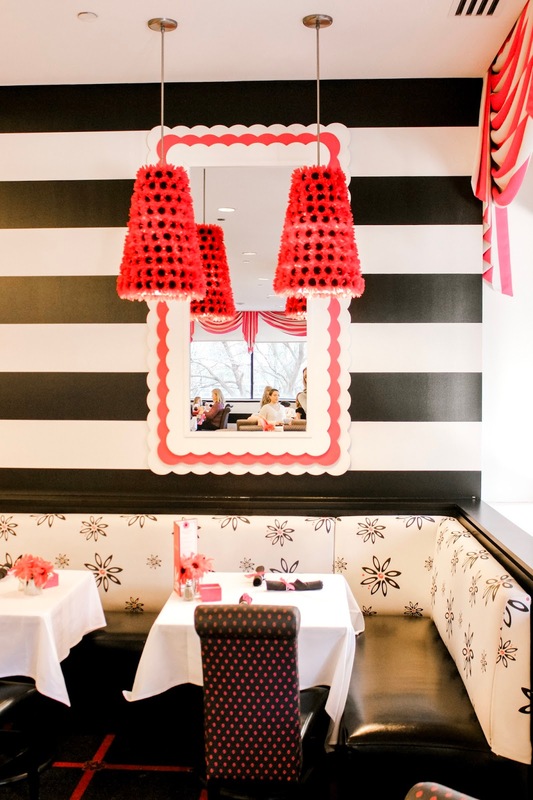 When you walk into the store you instantly feel like you have entered into a little girl's version of heaven. The first floor is dedicated to all the historical dolls, Bitty Babies and Wellie Wishers, so much to see and play with. 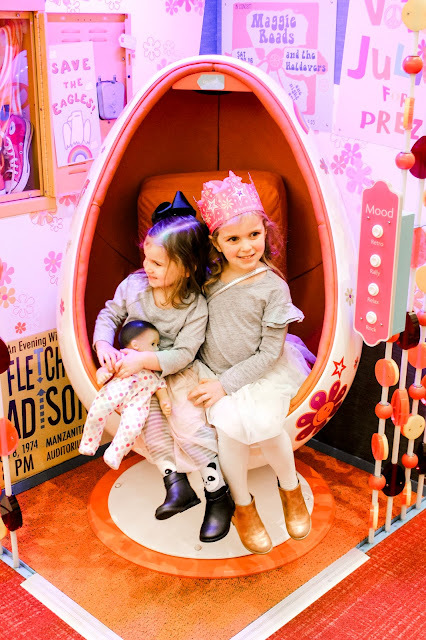 We especially loved the historical doll area because they each had their own little photo-op, we of course had to stop by and snap a picture in Julie's groovy chair and seriously how stinking cute do they look in there, melt my Mama heart! There were so many cute little areas to explore, but we did most of our shopping at the end of our visit because our girlfriend Willa had a much needed hair appointment up on the third floor, yes, that's right, there is a doll hair salon in the store! 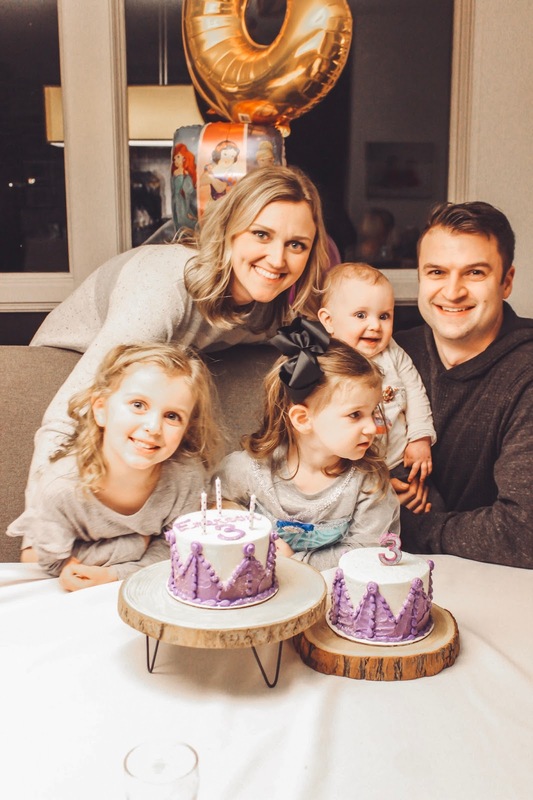 Avery got a Wellie Wisher for her 3rd birthday and poor Willa's hair was a bit of a hot mess! The doll salon is actually one of the cutest things ever, complete with a stylist chair and cushion for the smaller Wellie Wisher dolls! Avery got to pick a new hair style for Willa and stood right at the counter while the stylist worked on her doll. The stylist was SO sweet, encouraging Avery to tell Willa she was doing a great job sitting still etc., it was so fun! Another sweet little moment was when the stylist heard we were celebrating the girl's birthdays, she gave them each a "Happy Birthday" sticker and even had a mini version for their dolls. 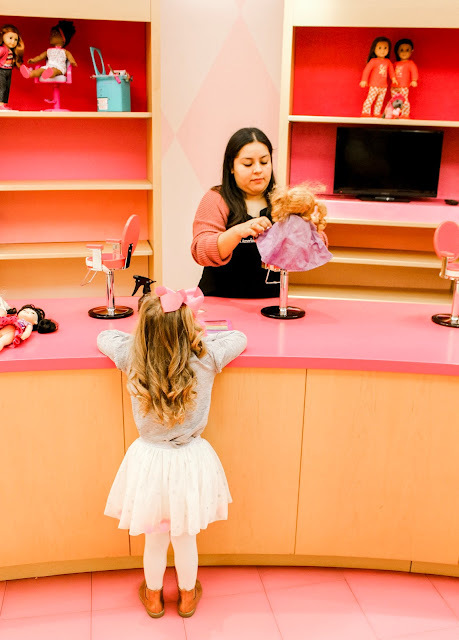 To top off the visit to the salon, the girls Wellie Wishers got their ears pierced, I mean American Girl has really thought of everything, which just about blew Avery's mind! Next up we headed to the restaurant and had the best birthday lunch! 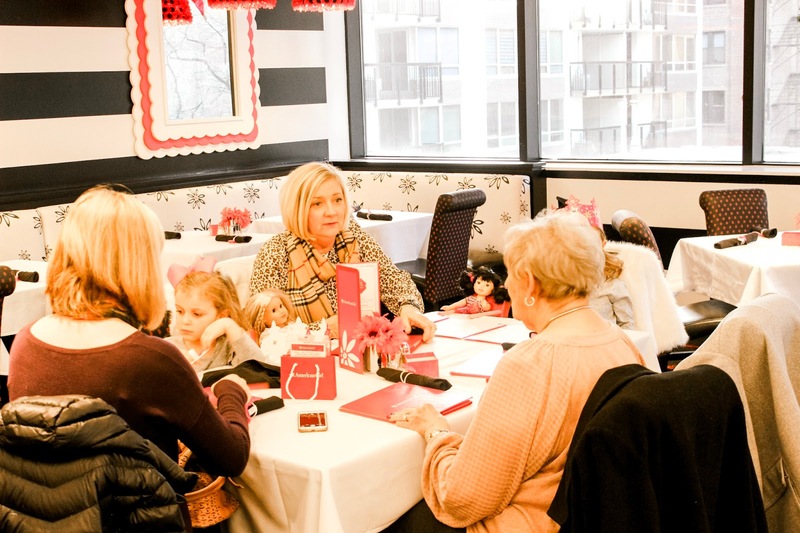 I made a reservation a few months prior to Emmy's birthday and was able to reserve a table for six along with a special "Birthday" themed lunch. 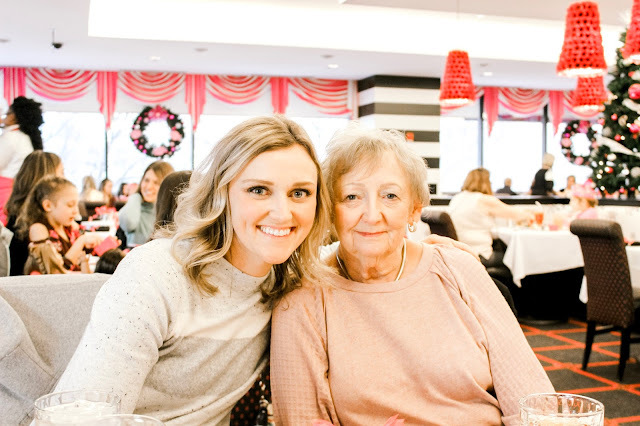 We all could not get over the sweet details throughout the lunch! Each doll, even Emmy's beautiful Cry Baby, got a high chair to sit in, as well as a small placemat, plate and glass, my girls are never going to want to eat anywhere else! 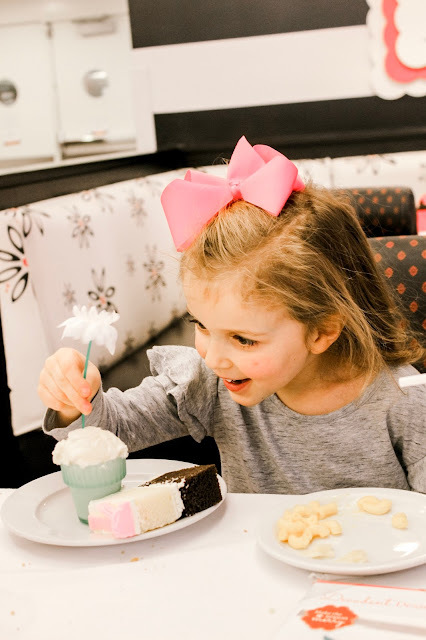 The meal was surprsingly delicious and the girls were thrilled when the waitress brought out a birthday cake with the cutest little flower pot filled with vanilla ice cream, topped with a daisy. I'm telling you, every single detail was so sweet. The girls also got a birthday crown and goodie bag as part of the birthday package, all the thoughtful details made for such a sweet and special memory! We ended our visit with a little shopping. Upstairs are all the "Truly Me" dolls, as well as, the doll of the year. 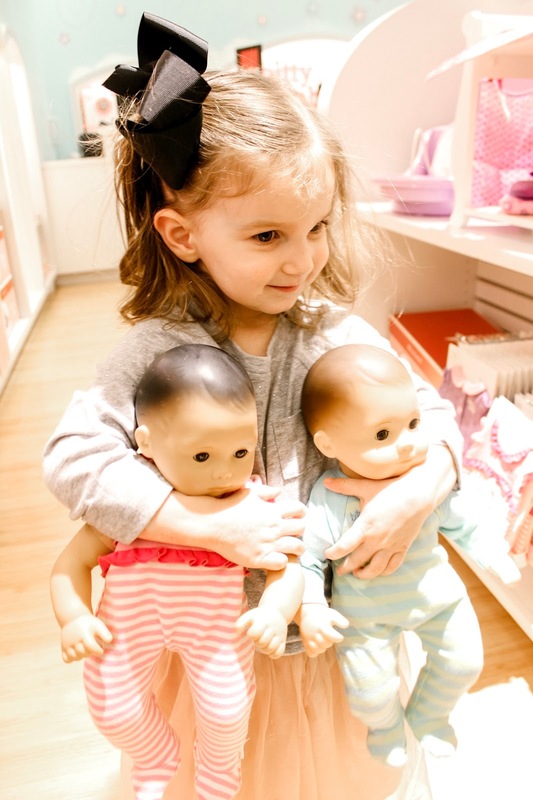 Avery really loved all the outfit sets for the "Truly Me" dolls and Emmy just liked touching every little thing, but girlfriend was really in heaven when we headed back down to the Bitty Baby section! 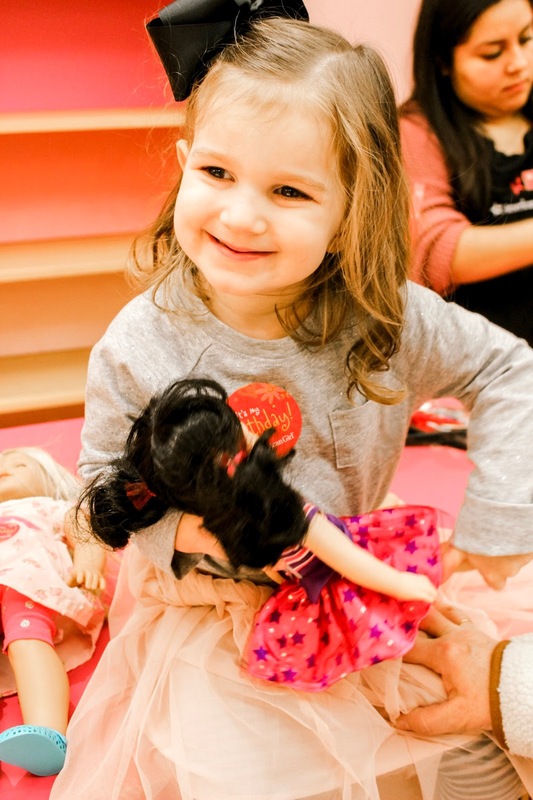 It's so fun to go to a physical American Girl store because you get to actually see and play with all of the products. Emmy really loved the pretend washer and dryer, which unfortunately for her, did not come home with us. 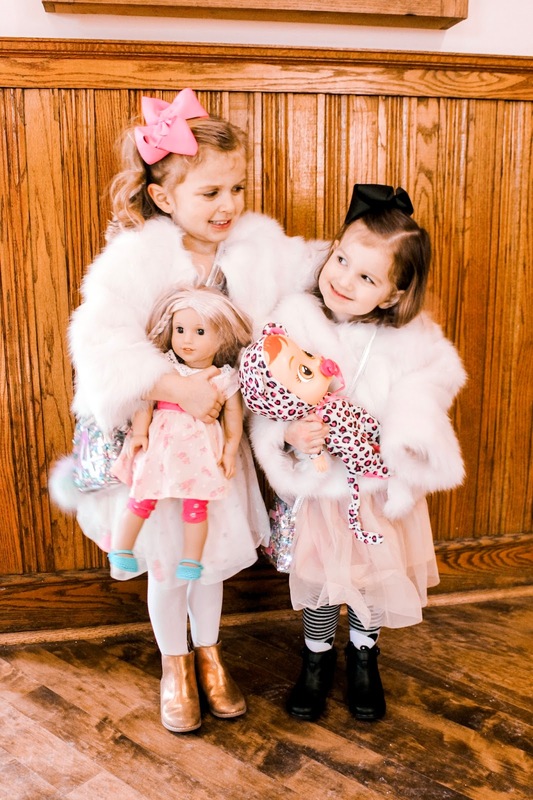 She did pick some new outfits for her Wellie Wisher doll, named Emerson, which is extra fun. 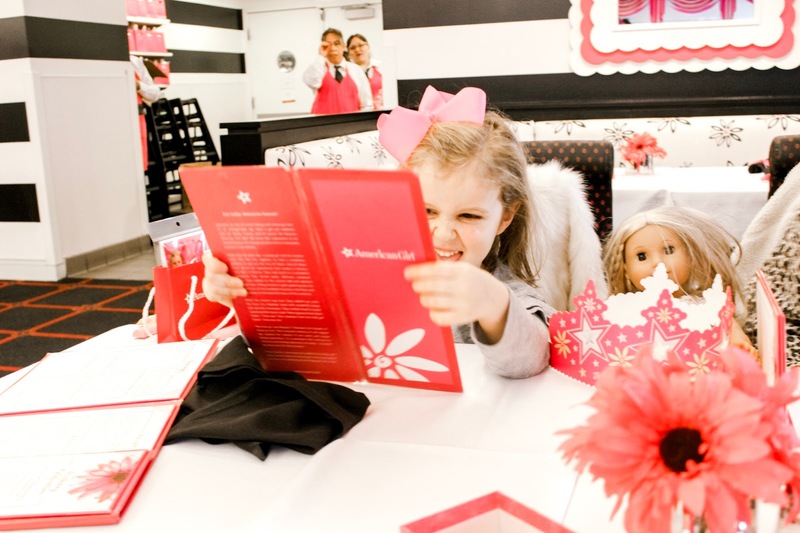 Avery was a wild woman, having the best time shopping around the entire store, she ended up picking a few outfits out for her doll and has already made her birthday wish list for next year! 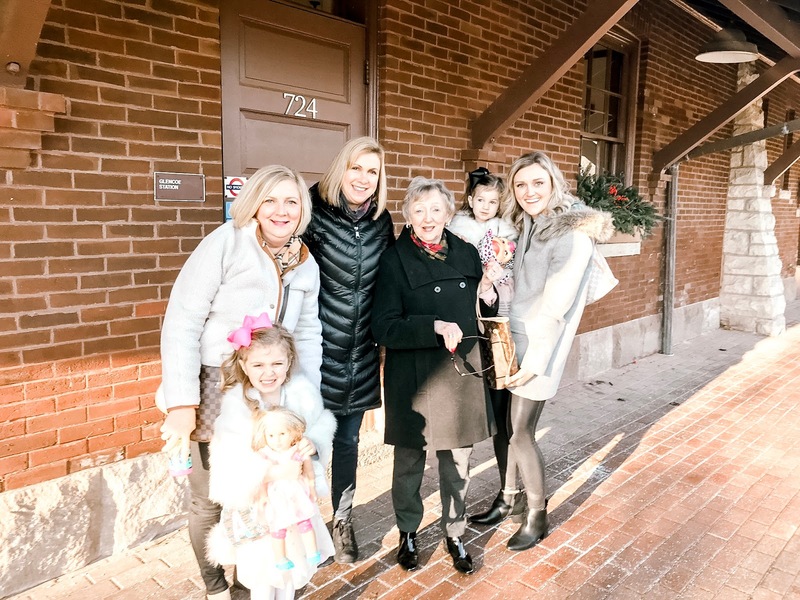 We truly had the best girls day and can't wait to plan another trip back to the store, it was extra special to get to spend time with most of the girls favorite women in our family, we will all always cherish these sweet memories! We ended the day with a train ride back home to Nana and Pop Pop's house for pizza and cake, it was such a fun and special day, the perfect way to celebrate our sweet Emerson's birthday! 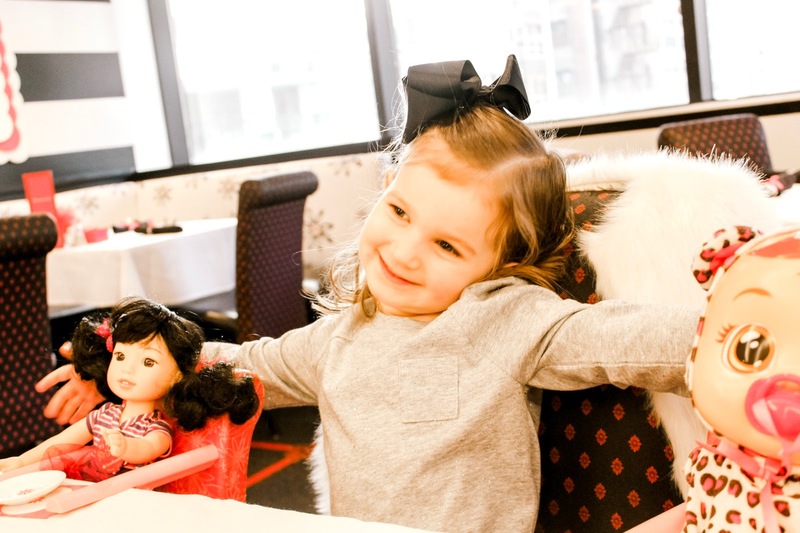 We are so blessed to have this little firecracker in our family and can't wait to see what year THREE has to bring for her, may all your birthday wishes come true sweet girl!